This is my daughter’s favorite way to eat zucchini. This recipe makes two loaves of bread, but they don’t get very tall. I have also made it into just one loaf and it baked just fine. You will need a grater or food processor to shred the zucchini. You will need one or two 9″x5″ loaf pans, depending on whether you want one tall loaf or two short loaves. If you have a stand mixer, it makes mixing it a breeze. By hand works well too. Grease and flour one or both loaf pans. Set aside. Add eggs to your mixing bowl and beat well. Add the sugar and oil and beat together. Next add in the creme de cocoa or extract and the cocoa powder. Once that is blended in, add the zucchini. Mix in the flour, salt, cinnamon, and baking powder. Stir in the chocolate chips. Scrape into your prepared pan or pans. Bake for 1 hour. Test with toothpick to see if it is done. Remove to wire rack. Let cool in pan before removing. Using one pan instead of two does not significantly increase the cooking time. Most everybody likes some chocolate once in a while. But, sometimes you don’t have any on hand or you want to go with something healthy or you don’t want to go to the trouble of making them because it can be complicated and take a long time. But, these candies are simple. Fast to make and as healthy as a candy that you are probably going to find. The longest part is waiting for them to firm up enough to eat. This will make enough for 12 candies. 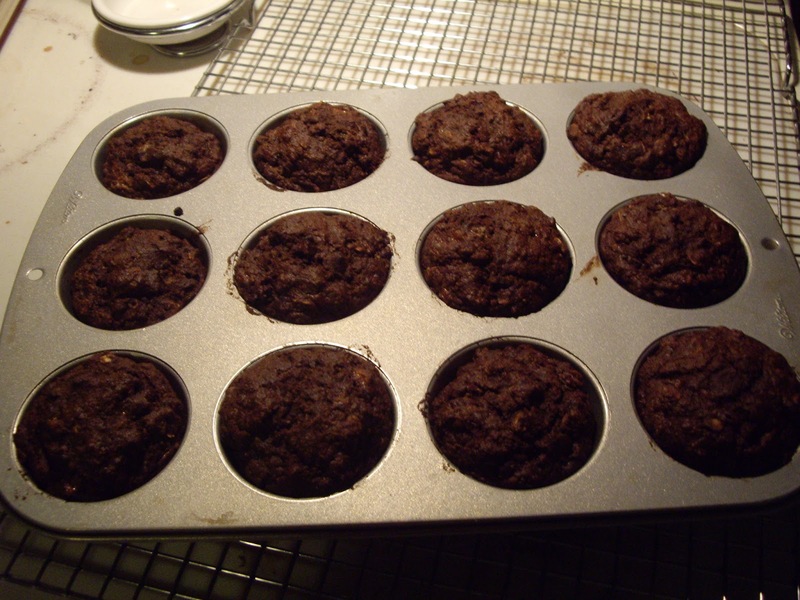 You will need a mini muffin pan with 12 muffin cups. You will need an immersion blender. A whisk will work or a regular blender. Take out your mini muffin pan. 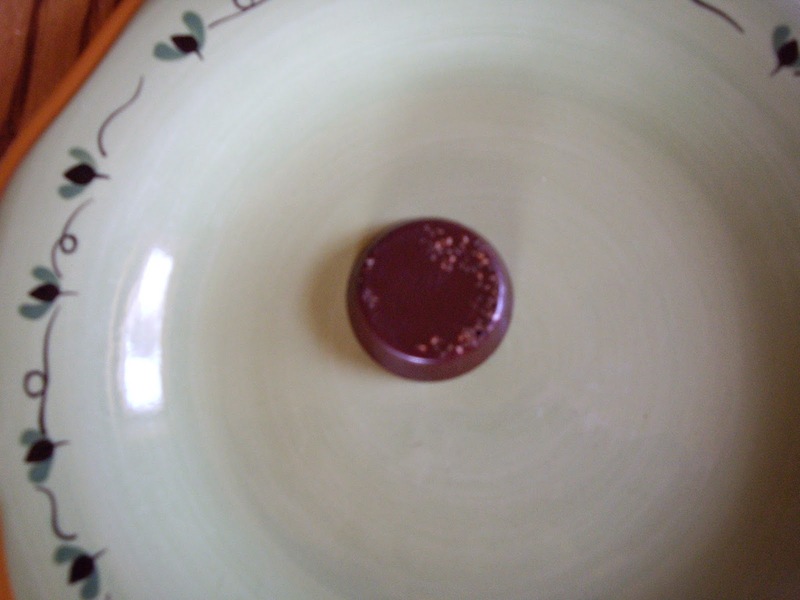 If you want anything in your chocolate candies, sprinkle some of what you are using in the bottom of each cup. Put in a container that you can easily pour from and that will allow you to use the immersion blender or whisk. Or pour into the jar of blender. Add the honey and blend in well so it does not separate. Blend in the cocoa powder and optional vanilla extract. Divide the mixture evenly between the muffin cups. If you used a whisk, you will need to make sure to whisk between pours so the honey doesn’t separate. Put into the freezer and keep in there for 30-60 minutes until the candies have firmed. You can now take them out of the muffin pan pretty easily. I have never tried just plopping them out. I take a knife and carefully lift them out. If you have raw cacao powder, you will also get additional health benefits. I do recommend keeping these in the fridge so they don’t melt or get too soft. This is a repost from July of 2009. When I started this blog, I didn’t post pictures so this doesn’t have one. I didn’t think about U until today so I don’t have the stuff to make them and post a picture. Once I start eating these, I just don’t want to stop. These cookies are known by many names. They can also be called chocolate drop cookies or minute cookies. Whatever you call them, you have to include the word good to describe them. Line a baking sheet with waxed paper or aluminum foil. Combine the oatmeal and cocoa powder and set aside. In a large pan melt the butter and peanut butter over low heat. Stir it constantly til mixture is smooth. Remove from the heat and stir in the milk. Gradually mix in the powdered sugar. Blend in the oatmeal and cocoa powder. Drop by spoonfuls onto waxed paper. You will get 4-5 dozen. If you don’t have foil or waxed paper, buttering your pan works great. There is nothing like something chocolatey and warm to start your day. They also keep well. So, make them the night before to speed things up in the morning. Grease the bottoms of 12 regular size muffin cups. In a large bowl, combine the flour, oatmeal, sugar, cocoa powder, and baking powder. In another bowl, beat the milk, oil, egg, and vanilla extract. Stir the milk mixture into the flour mixture. Just stir til everything is wet, but do not overmix. Divide batter evenly among the 12 muffin cups. Bake for 18-20 minutes until they test done when poked with a toothpick. Remove from pan and let cool for about 5 minutes. The olive oil will make them rise a little more than other oils you may use. Overmixing will cause the batter to peak while baking and the peaks may crack. They still taste good though. I love these brownies. They may have a little different texture than you are used to, but you can not taste the black beans at all. 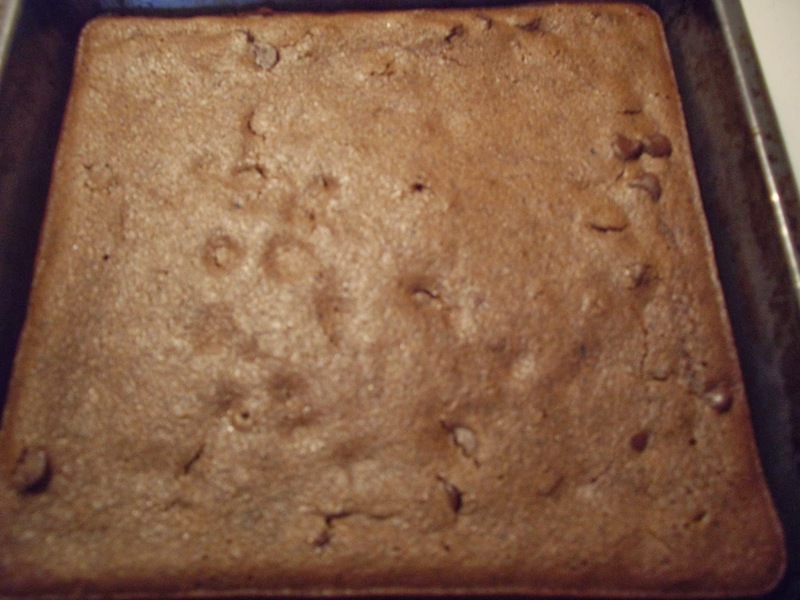 There is absolutely no flour in these brownies, which makes them gluten free. You will also need a food processor for mixing. Rinse the black beans and cover with water. Bring to a boil, cover with lid left ajar and took until beans are soft. This takes about an hour to an hour and a half. When done, drain. You should have 1-1/2 cups cooked beans. If you have more than that, set those aside for something else. Put the blade in your food processor. Add the drained beans. Or you can drain and rinse a 15 oz. can of black beans and add those to the food processor bowl. Add the cocoa powder, coconut oil ,eggs, vanilla extract, and sugar. Put the cover on the processor and turn on, blending until smooth. Take off the lid and stir in the chocolate chips. 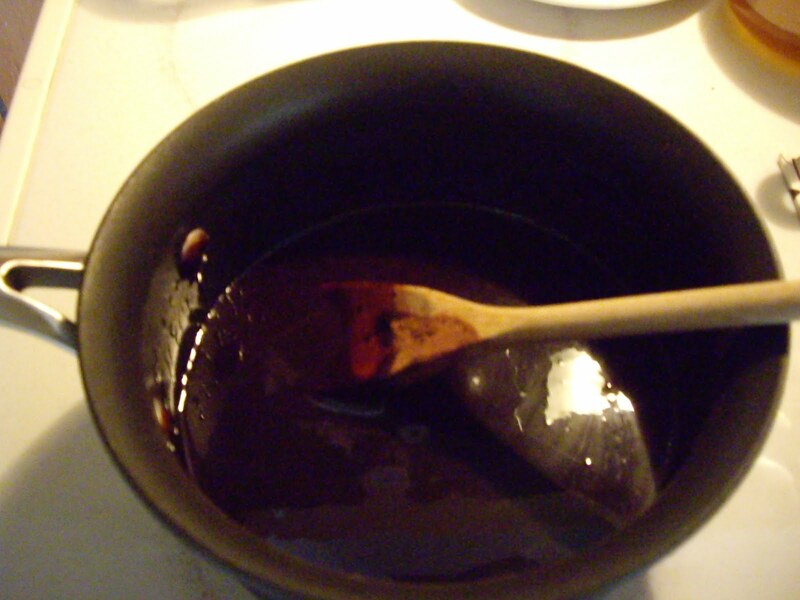 Scrape the batter into the greased pan and spread evenly. Bake for 30 minutes or until the brownies test done when poked with toothpick. They may just start to pull away from the sides. Take out of oven and let cool. I usually get 16 brownies out of a pan. They are pretty filling. I like coconut oil better in these brownies. However, butter is more economical and tastes pretty good too. This is my mom’s unbaked cookies recipe. The are so quick to make. They may take a little while to set up. Sometimes they set up right away. They sure are tasty! If you would like another version of unbaked cookies, I have those too. The other recipe is a has a richer, more complex flavor. Here is where to find those. You will need a large pan. A Dutch oven or similar size works great. You will also need waxed paper, aluminum foil, or buttered baking sheets. 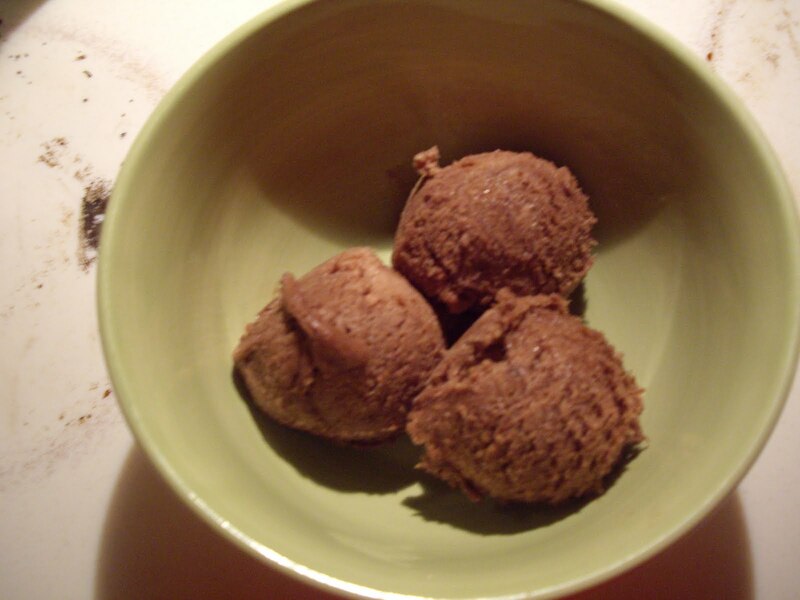 Combine the oatmeal and cocoa powder in a large bowl. Set aside. In the pan mix the sugar, butter, and milk. Stir and bring to a boil over medium high heat. Quickly, add the oatmeal and cocoa powder along with the vanilla extract. Stir in well and take off heat. 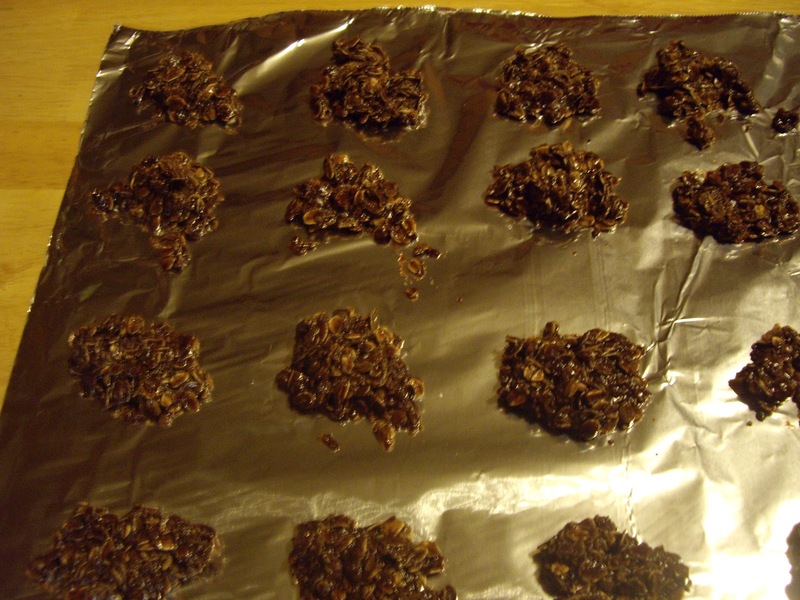 By spoonfuls drop onto waxed paper, aluminum foil, or buttered cookie sheets. This will make a few dozen, depending on the size you make them. 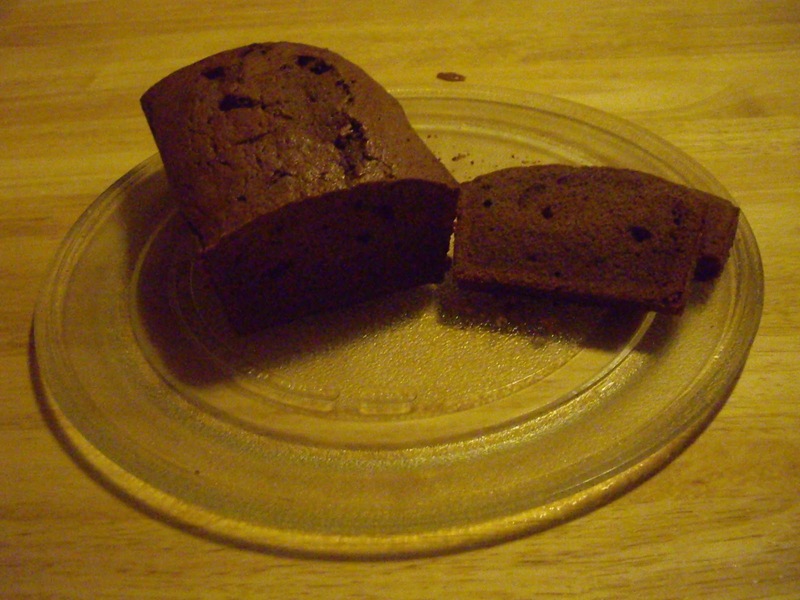 If you are a fan of quick breads and chocolate, you are going to love this bread. It is fantastic! Preheat your oven to 350 degrees Fahrenheit(175 Celsius). Grease and flour a 9″x5″ loaf pan. In a mixing bowl, combine the flour, cocoa powder,baking powder, baking soda, and salt. In another mixing bowl, cream the butter and sugar. Blend in the sour cream. Gradually mix in the flour mixture. Scrape the batter into the greased and floured loaf pan. Bake for 60-70 minutes until a toothpick comes out clean when poked into the middle of the bread. Remove from the oven and let sit for about 15 minutes. Loosen and remove from pan and let cool on a wire rack. Who doesn’t love some frozen chocolatey goodness in the heat of the summer? This is a really great treat and simple to make. You don’t even need an ice cream freezer for this. Get out your blender or food processor. You will also need a container with a lid for storing and a 9″x9″ pan. Take your storage container with lid and put it in the freezer to chill. In the container of your blender or food processor add 1 cup of the milk, sugar, and cocoa powder and blend on high for 1 minute. Add the rest of the milk and vanilla extract and blend for another minute on low. Pour the mixture into the 9″x9″ pan. Stick in the freezer for 1 to 2 hours til there is a thin frozen crust on the top. Put the mixture back into the blender and blend til smooth and creamy. Pour the mixture into the storing container and freeze for another hour or until firm. Chocolate cake is great. But, what happens when you are out of eggs? This is what happens. Mayonnaise replaces the eggs and butter and makes a moist delicious cake. You will need a 9″x13″ baking pan. Grease and flour it. In a medium bowl, whisk together the cocoa powder and water. Cool to room temperature. Whisk in the vanilla extract and the mayonnaise. Set aside. In a large mixing bowl, blend the flour, sugar, baking soda, and salt. Add the cocoa mixture. Mix with a mixer on low speed until everything is moistened. Increase the speed to medium and beat for 1 minute. Use high speed with a hand mixer. The batter may seem thin. That is OK.
Pour the batter into the baking pan. 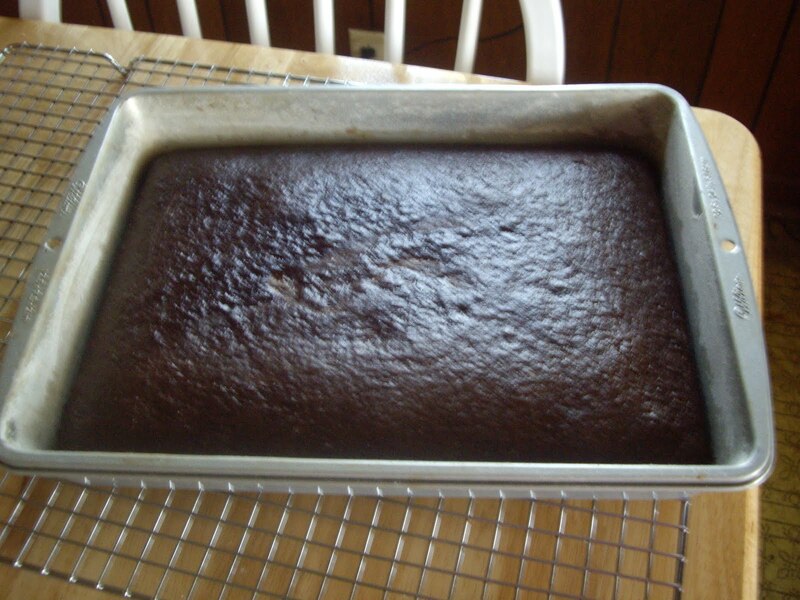 Bake for 40-45 minutes or til a toothpick comes out clean when poked into the center of the cake. If you want to you can use all-purpose flour. If you do only use 1-3/4 cup all-purpose flour instead of the 2 cups cake flour. 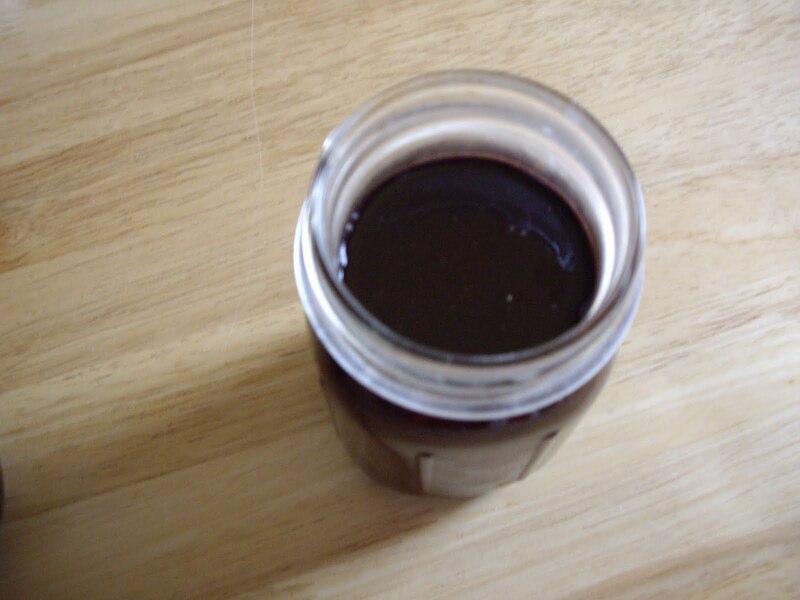 This chocolate syrup is great for making chocolate milk or spooning over ice cream. It’s not as sweet as the chocolate syrup you’d buy at the store. It is a darker tasting chocolate. It is really simple to make. Makes 2 to 2-1/4 cups syrup. You will need a 2 quart saucepan. In your saucepan combine all the ingredients. Heat to a boil over medium heat, stirring constantly. Turn down heat to low and let it simmer but continue to keep stirring for another 3-5 minutes. Remove from the heat and cool slightly before putting in a container. Keep it stored in the fridge.